LOTUS FOODS ORGANIC MILLET & BROWN RICE RAMEN.RICE IS LIFE.WHOLE GRAIN NOODLES.LOTUS FOODS ORGANIC RICE RAMEN MILLET & BROWN.USDA ORGANIC.GLUTEN FREEVEGAN. 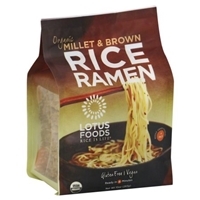 Brand/Manufacturer: LOTUS FOODS Lotus Foods, Inc.
Organic brown rice flour, organic millet, organic white rice flour. Gluten free. 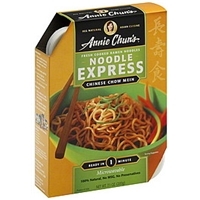 Noodles: wheat flour, water, tapioca starch, wheat gluten, salt, dried egg white, lactic acid, riboflavin (vitamin b2). 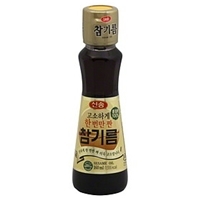 Sauce: sauce: naturally brewed soy sauce (water, wheat, soybeans, salt, alcohol, vinegar, lactic acid), evaporated cane juice, roasted sesame oil, garlic, soybean oil, sherry wine, natural flavors, corn starch, onion (dehydrated), garlic (dehydrated), scallions (dehydrated), spices, ascorbic acid. 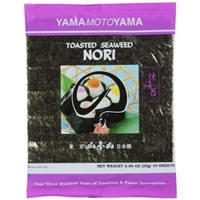 Topping: bok choy (dehydrated), green, onion (dehydrated), carrot (dehydrated), sesame seed (dehydrated), onion (dehydrated).product manufactured in a facility that uses peanuts. Do not eat if seal is broken. 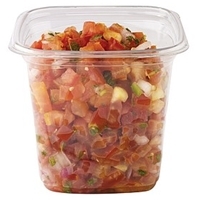 Bowl may be hot after microwaving. 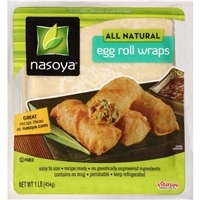 Brand/Manufacturer: NaSoya Vitasoy USA Inc.
Enriched wheat flour [flour, niacin, reduced iron, thiamine mononitrate (vitamin b1), riboflavin (vitamin b2), folic acid], water, salt, wheat gluten, vinegar, eggs, egg whites, cornstarch. 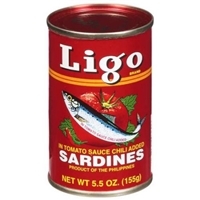 Brand/Manufacturer: ligo JFC International Inc.
Sardines, tomato sauce which is made from tomato paste and water, modified cornstarch, iodized salt, sugar, onion powder, garlic powder, chili. Wheat flour, fresh red chilis, sea salt, water. Stir-fry rice noodles: rice flour, water, sea salt. 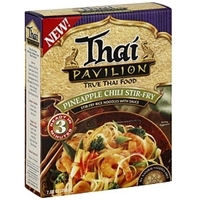 Sauce ingredients: fresh pineapples, soy oil, fresh onions, cane sugar, fish sauce (anchovies, sea salt, water, cane sugar, vinegar), sea salt, fresh red chilies, fresh carrots, tapioca starch, turmeric. Gluten free.contains soybeans, fish. Manufactured in a facility that uses peanuts. 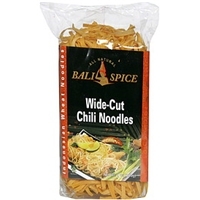 Rice noodle packet: rice noodles (rice flour). Seasoning packet: spice mix (garlic, chili, onion, pepper), maltodextrin (corn), sugar, hydrolyzed soy protein, purified rock salt, yeast extract, dehydrated chilies and dehydrated spring onions. Oil packet: chili oil (soybean oil, chili paste oil). Gluten free.contains soy. Manufactured in a facility that uses peanuts. Stir-fry rice noodles: rice flour, water, sea salt. 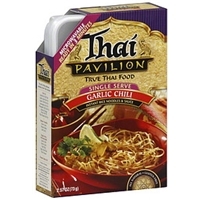 Sauce: fresh garlic, soy oil, soy sauce (water, soybeans, sea salt, cane sugar, vinegar), fresh yellow chilies, fresh cilantro, oyster sauce (water, cane sugar, sea salt, oyster extract, cornstarch), cane sugar, fish sauce (anchovies, sea salt, water, cane sugar, vinegar), tapioca starch, white pepper. Gluten free.contains soybeans, fish. Manufactured in a facility that uses peanuts. 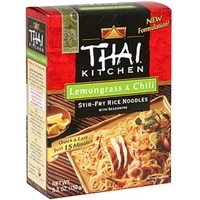 Brand/Manufacturer: Thai Kitchen Simply Asia Foods, Inc.
Rice noodles (rice, water), seasoning packet (sugar, maltodextrin, spices [onion, chili, garlic, lemongrass, pepper], hydrolyzed soy protein, yeast extract, tamarind (dried), salt, green onions (dried), shallot (dried), natural flavor), oil packet (soybean oil, shallot, tocopherol (vitamin e]). Gluten free.manufactured in a facility that processes peanuts.